Hope that you have had time to visit Bucks County Museum to see the Ex Libris: Altered Books exhibition. It will finish on 24th February. On that day 24th February 10 a m – 4 p m I shall be running a workshop at the Museum. 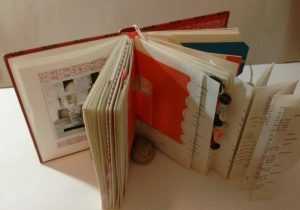 A marvelous opportunity to learn the basics of the art of altered books with me. In this workshop you will investigate simple techniques to start respectfully altering a book. You will choose a book from a selection supplied that are ready for recycling. Techniques that will be covered include strengthening pages, folding, cutting cavities and making pockets whilst retaining the quality of the book as an amazing piece of flexible engineering. If time permits embellishments will be discussed and you will start to decorate the pages. At the end of the day you will have a book ready for you to continue altering. No previous experience is needed. Cost will be £45 to book please call 01296 331441 or book on line with the museum.